A Chandra observation of the galaxy cluster A2104 revealed six bright X-ray sources that are associated with supermassive black holes in red galaxies in the cluster. Since red galaxies are thought to be composed primarily older stars, and to contain little gas, the observation came as a surprise to astronomers. 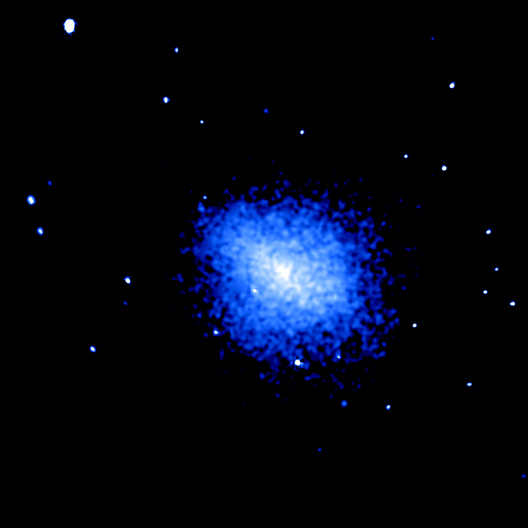 Powerful X-ray emission from a supermassive black hole comes from gas heated as it falls toward the black hole, so an abundant supply of gas is needed to produce the bright X-ray sources detected by Chandra. It is generally believed that as galaxies move through the hot cluster gas at high speeds, they are stripped of their interstellar gas, much as a strong wind strips leaves from a tree. 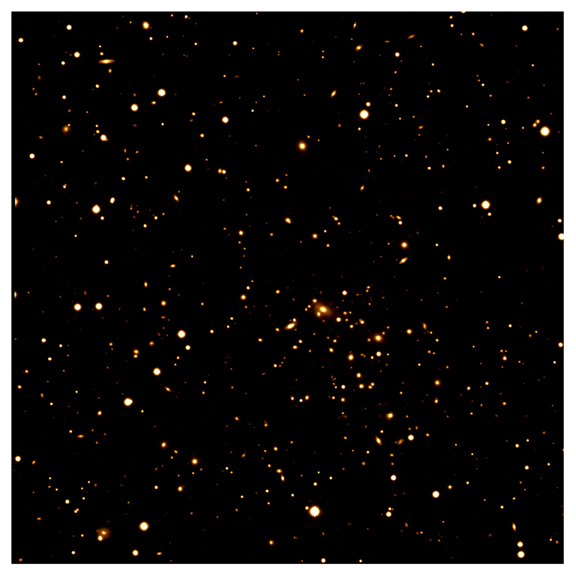 Galaxies can also lose gas through collisions with other galaxies in the cluster. The presence of these six X-ray sources indicates that these supermassive black holes have somehow retained a fuel source, despite the harsh environment of the clusters. It could be that galaxies are better at holding onto a supply of gas and dust than previously thought, particularly deep down at their cores near the supermassive black hole. Such gas and dust may explain why the centers of the galaxies are obscured at optical wavelengths. Scale Image is 10 arcmin on a side. Coordinates (J2000) RA 15h 40m 07s | Dec -03° 17´ 24.00"